Striking evidence has been found for the enigmatic "stuff" called dark matter which makes up 23% of the Universe, yet is invisible to our eyes. The results come from astronomical observations of a titanic collision between two clusters of galaxies 5.7 billion light-years away. Astronomers detected the dark matter because it separated from the normal matter during the cosmic smash-up. The research team are to publish their findings in the Astrophysical Journal. They used the Hubble and Chandra space telescopes to study the object MACSJ0025.4-1222 - formed after an incredibly energetic collision between two large galaxy clusters. Each of these large clusters contains about a quadrillion times the mass of our Sun. A technique known as gravitational lensing was used to map the dark matter with Hubble. If an observer looks at a distant galaxy and some dark matter lies in between, the light from that galaxy gets distorted. It looks as if it is being seen through lots of little lenses. And each of these lenses represents a piece of dark matter. Astronomers used the Chandra X-ray telescope to map ordinary matter in the merging clusters, mostly in the form of hot gas, which glows brightly in X-rays. As the two clusters that formed MACSJ0025 merged at speeds of millions of kilometres per hour, hot gas in the two clusters collided and slowed down. However, the dark matter kept on going, passing right through the smash-up. This phenomenon has been seen before, in a structure called the Bullet Cluster - which also formed after the collision of two large galaxy clusters. The Bullet Cluster lies closer to Earth, at a distance of 3.4 billion light-years. "It puts to rest all the worries that the Bullet Cluster was an anomalous case. We have gone out and found another one," co-author Richard Massey, from the Royal Observatory Edinburgh, told BBC News. 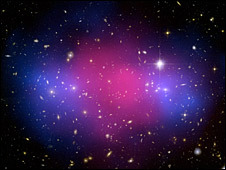 The study sheds light on the properties of dark matter. The fact that dark matter does not slow down in the collision supports a view that dark matter particles interact with each other only very weakly or not at all (when one excludes their gravitational interaction). "Dark matter makes up five times more matter in the Universe than ordinary matter," said co-author Marusa Bradac, from the University of California at Santa Barbara (UCSB). "This study confirms that we are dealing with a very different kind of matter, unlike the matter that we are made of. And we're able to study it in a very powerful collision of two clusters of galaxies." The latest astronomical observations suggest that dark matter makes up some 23% of the Universe. Ordinary matter - such as the galaxies, gas, stars and planets - makes up just 4%. The remaining 73% is made up of another mysterious quantity; dark energy, which is responsible for speeding up the expansion of the cosmos. According to one model, dark matter may be comprised of exotic sub-atomic "stuff" known as Weakly Interacting Massive Particles (WIMPS). Others hold that the dark substance consists of everyday matter, rather than some elusive sub-atomic particle. However, this ordinary matter, referred to as Massive Astrophysical Compact Halo Objects (MACHOS), happens to radiate little or no light. 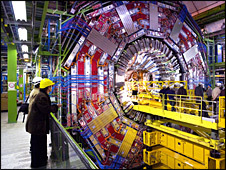 A powerful physics experiment, the Large Hadron Collider, situated on the French-Swiss border, could shed further light on this question after it begins operating later this year. Dr Massey said his team had found other candidates for colliding clusters. "Ideally, we don't want just one or two, we want lots of these things to really study them statistically," he explained. "Then we either use the whole lot, or pick out one 'golden bullet' which will provide the best constraints on what dark matter is." The Hubble Space Telescope failed just after the team had taken their image of MACSJ0025, so they have not yet been able to study these other candidates. Dr Massey said the astronomers hope to do this after the next Hubble servicing mission with the space shuttle, which is due to launch in October 2008.